Hi there. Welcome to Part 2 in this series. You can read Part 1 right here, if you missed it. Okay then. Let’s get started with the stalwart tips on copywriting minus the evil and/or annoying bits. DO YOU SELL USED CARS?! 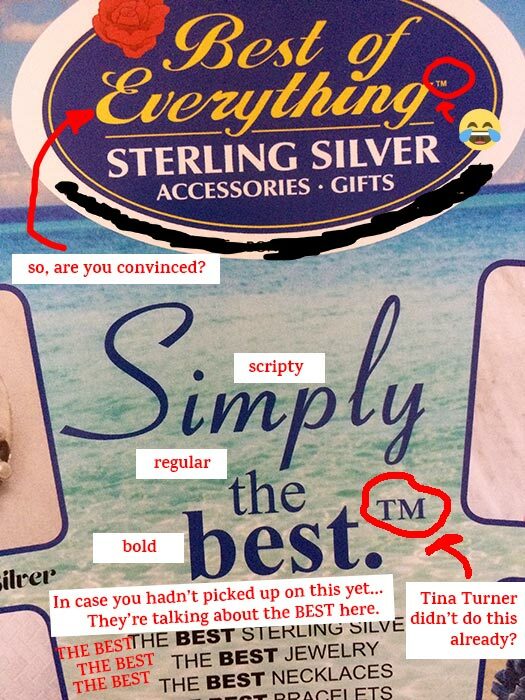 ARE YOU WRITING AN INFOMERCIAL SCRIPT?! No? 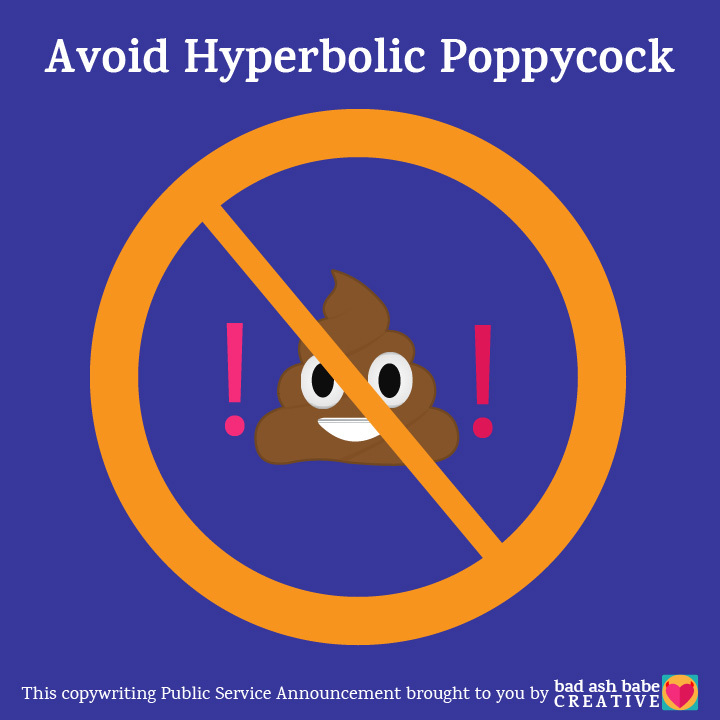 Then you’ll want to avoid the pattern of hyped-up-sales-speak I see too many good people fall into when they write advertising copy. I don’t know about you, but when a business claims to be the best or the premier or the newest and most innovative or promises anything like a miracle, I’m likely to think, “yeah right,” and then promptly turn the page, click away, or scroll elsewhere. Why? Because it insults my intelligence. For one thing, I don’t believe in silver bullets (and neither should you). For another, I can understand what I’m being told without the morning show DJ level of caffeinated. Please. Just explain your product to me in easy-to-understand terms. Make it relate to my life, and I’ll listen to you. Delight me with some clever wit, and I’ll even enjoy hearing what you have to say. Amiable, straightforward and informative will win my attention (and my dollars) more than bombastic bamboozle every time. Perhaps some demographics are best influenced using hyperbole and falsities (insert topical political joke here), but if you’re a brand with soul, this is not your style. Try this: When revising your sales copy, look for any words that might fall into the zone of exaggeration. See if you can communicate the same benefit without the hype. And so this is how I approached writing words to be read on a top-forty station in the middle of Iowa. The GM brought me into his wood-paneled office and, with good humor and grace, explained that what I write for the radio should be easy enough for an average 8th grader to understand. This was a bit of a tough pill for this wordnerd to swallow. But swallow it I did. And, when I write advertising copy, swallow it I continue to do. I even force the damn pill down the throats of others these days. Because if I have to regularly kill my own erudite darlings, yours have to go too. Why? Because most people outside of the academic, publishing or art worlds don’t use words like paradigm or juxtaposition in their daily conversations. I happen to love both of these words and think they work beautifully in many places. But in ad copy they come off as a pretentious attempt to make the product sound impressive rather than simply telling us how it could improve our lives. Of course, with the right audience, you can slip in some high brow verbiage. The MOMA membership should be addressed in a tone different from the one you use to write an Airbnb vacation rental description. This doesn’t mean that your language should be boring, however. Please, DO use words that are rich with meaning. 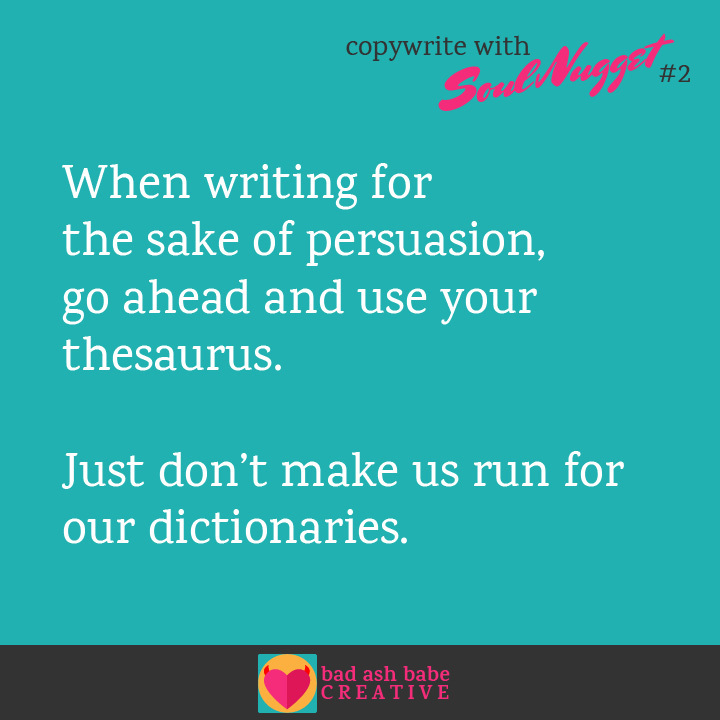 Try this: Remember when writing for the sake of persuasion, go ahead and use your thesaurus. Just don’t make us run for our dictionaries. I hope these opinionated little nuggets will be helpful when you go about writing your own advertising copy. I have even more to share on this topic! It started with Part 1. And will continue with parts 3, 4 and potentially more.